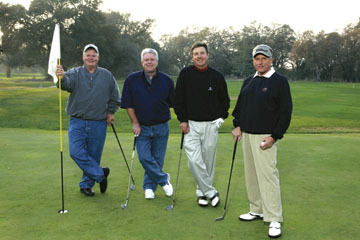 Dave Schumacher, Bob Fleming, Marc Arcuri and Dan Condie have been a foursome for a decade. All play in low single digits. They take the game seriously and they don’t cheat. Their saga began April 13, 2005. Nothing about the day seemed unusual. Slightly overcast skies and mid-60s temperature let them hope that the long, wet season was over. They were ready to shake off the rust, bet a little and have some fun. All four were busy that Wednesday morning, so they picked a short course for their afternoon game. Antelope Greens Golf Course is a tiny oasis in an area that hasn’t fully recovered from the closure of McClellan Air Force Base nearly a generation ago. It’s bordered on one side by small, hardscrabble farmland and on the other by neighborhoods a few coats of paint removed from the days when the base flourished. The course is tabletop flat. A few water hazards and several sand traps are sufficiently conspicuous to rattle the novice and challenge the mediocre. It’s usually in good shape, especially the greens. You can play 18 holes in 150 minutes for under a dollar a hole. All in all, the course is pleasing to the eye and attracts every level of player. Schumacher, the 62-year-old dean of the foursome, was not pleased. He couldn’t find the swing that had served him so well for decades. He was excused from all bets on the back nine, but labored on because of the camaraderie and the veteran golfer’s hopeless optimism that the cure was but one swing away. Playing “ready golf,” Schumacher fired first on No. 15. With the forward flag, the hole was at 108 yards. His shot was straight but just short of the green. He resheathed his wedge, silently asked the golf gods to restore his tempo and turned to watch his pals. Fleming’s sand wedge landed a yard short and a foot left of the stick and kicked into the cup for his sixth career ace. He accepted the kudos of his mates and happily recorded four dots for himself on the scorecard. Arcuri, next up with his pitching wedge, sent the shot dead at the flag. It took one big bounce and slammed into the hole. An outburst of shouting transformed the gray-haired foursome into something that sounded like kid noise. Following a full round of high-fives, Arcuri fairly skipped off the tee while Fleming erased the dots he’d awarded himself prematurely. As Condie went into his preshot routine, the air was electric. Condie addressed the ball. Half an instant before he could pull the trigger, his cell phone announced a call with its programmed “can-can” dance theme. All composures vaporized and Arcuri launched into his version of the dance in semiapproximate time to the thin electronic music. The group tolerated the interruption because Condie, their youngest member, has youngsters at home. Sure enough, this was his 11-year-old daughter seeking a delay in homework in favor of playtime with a friend. Condie negotiated the deal with her, returned the tee and shook off as much chagrin as possible. With half a smile, Condie inhaled and swung the club. He made solid contact. The ball hit the front of the green and rolled four feet, seemingly in slow motion, straight into the already-crowded cup. Three swings, three aces! Utter disbelief. The foursome went ballistic. They had made history, but there were no other witnesses. The group could not quiet down. Arcuri says, “We were in shock—just silly and dumb.” Condie said, over and over, “We just made history.” Schumacher describes his mind as a “complete vacuum; no words, no thoughts; just total amazement.” Fleming’s first words were “Nobody’s gonna believe this.” They finally found enough composure to finish the round and rolled into the clubhouse to announce their miracle. The Sacramento Bee was called, and the story of the three aces was, rightfully, on Page 1 the next morning. The article was picked up instantly by the national media machine. After a friend called KCRA Channel 3, NBC sent a news crew from its Bay Area affiliate. Then “The Today Show” sent a crew to film the foursome—all of whom were exhausted but excited that their remarkable story was receiving national coverage. Disappointment came quick. They were told that “The Today Show” co-host Matt Lauer didn’t believe and wouldn’t run the story. The foursome was terribly let down but felt powerless to counter the network news. After an intense search for a polygraph examiner of highest credibility, the foursome was steered to Paul Redden, senior polygraph examiner for the San Diego Police Department. His reputation was indisputable. A frequent expert witness, Redden had also appeared, ironically, on “The Today Show” in his professional capacity. Redden, himself a golfer, put the foursome through an eight-hour, $4,000 state-of-the-art polygraph procedure. His assessment: “I have no doubt about their honesty. Each man passed easily and I grilled them.” Redden asked two independent experts to interpret the results as well, and they concurred fully. The polygraph results received a touch of media attention but, by then, the story of the three aces had largely faded away. The foursome didn’t mind. Notoriety was never their goal. They have long known that golf is a game of great highs and ghastly lows. They lived a miracle, then had to fight for their honor. Though it was a frustrating and costly journey (much like golf), they will prevail.